It’s my favorite time of the month again! 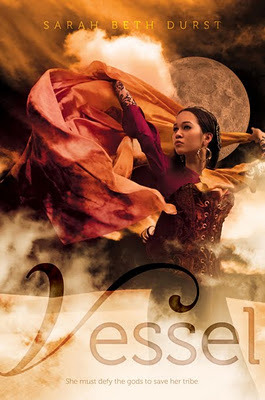 Have a mix of downright gorgeous and intriguingly detailed covers for you today. Without further ado, let’s jump in! 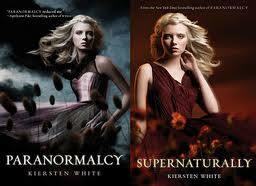 Endlessly, by Kiersten White. This one probably won’t be out until July, so we’ve got a bit to wait, but while it’s pretty enough on its own, it’s fascinating when next to its trilogy mates. The first book is one of stark contrasts, a black and grey background where the pink on Evie’s dress and her white blonde hair really stand out. There’s a storm brewing, one that deepens the clouds in the background and tosses the flowers in the foreground. Evie’s face is grave, looking straight out with a serious expression and her hand slightly raised in preparation for action (anyone else think that’s where she keeps Tasey?). Then we go on to Supernaturally where everything is a deep, heart’s-blood red. That shade of red isn’t just about love and passion; it’s about danger. That kind of red says blood will be spilled within. She’s still looking straight at us, still solemn, but there’s a touch of uncertainty there too, from the way her arm is raised (like she was just tucking a piece of hair behind her ear) to the way her lips are just slightly parted, as opposed to the compressed line of the first book. Then we get to the third book and the entire atmosphere changes. The clouds in the background are light and fluffy, more reminiscent of a serene sunrise than an impending storm, and the purples are bright and clean. Dark purples are regal, royal, intimidating, bruise-colored. Almost any other shade of purple is a pretty happy color. And look at Evie- she’s not looking at us, we’re not the danger anymore. She’s looking off to one side and, given the relaxed, hopeful smile on her face, she’s probably waiting for someone. Maybe even watching him (assuming it’s a him) walk towards her. The amazing thing about this cover is that it doesn’t ignore the allusions of danger in the two previous, but rather gives its audience hope that all of that danger will have a resolution by which Evie will benefit with something resembling a happily-ever-after. Vessel by Sarah Beth Durst appeals to me on so many levels. Half of the cover is partially veiled by a sandstorm, which is an immediate sign of danger (there are sandstorms strong enough to strip flesh from bones, if the danger seems understated here), but here it also obscures reality with the hint of an illusion. For those brave enough, stupid enough- perhaps desperate enough- the fringes of a sandstorm can hide a great deal, and can you ever really be certain what you see through the haze of sand? This cover has gorgeous detail, in the intricacy of the tattoos on her wrist (which must have a meaning or why bother in the art? ), the jewelry in her hair, even the texture of patterns of the fabric of her dress and the variegation of the fabric in her hands. That fabric, swept up over her like the beginning of a dance or swirling into a cloak is interesting- is it meant to obscure, to hide? Is it being spun away in a grand reveal? Is it a signal? Is it a religious ritual? So many different things that single piece of fabric could represent, and each with the potential for grand impact on a story. When taken in whole, though, from the disturbed sands to the prominent moon against a hot night sky, with this girl out in the clouds of sand with- a message? a warning? a task?- makes it seem like a fairty tale where we’re never quite sure what the ending will be, something half familiar that makes us constantly second-guess what we’re seeing. I can’t wait for this one but settle in: it’s not available unti September. This next one is just stunning. Striking might even be the word for it. Everything in the background is dead and blurred, bare rocks, skeletal remnants of trees or bushes (some kind of plant, anyway), everything veiled by that lifeless grey, like there is literally nothing else in the entire world than this place, this moment. Everything else has passed away. We get hints of black in the corners, the rotten core at the heart of the ghost of life. We also get hints of red, and by now I think we’ve all realized what I see when there’s red on the cover. In this case, however, with the way it weaves through the grey in the background, it’s more a sign of something in the past, something that’s already happened, and the story arises out of everything that happens after. And then the foreground, the girl in the fancy dress, a party dress, but the way she’s standing, her shoulder hunched, her body in three-quarters profile and her face turned completely away, it’s a party to which we are clearly not invited. The way the fabric shifts between stark reds and blacks is ominous, a pulse of a dead heart still trying to live. The parasol is sheer, not particularly suprising, but it still has an echo of those skeletal plant remnants. This is a book where Death isn’t just a companion, he’s the date waiting for you at the start of the ball. This promises to be dark and lovely, and if it’s anything like the story from which it takes its title, it should be amazing. 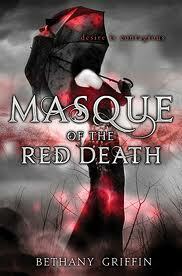 For Masque of the Red Death, by Bethany Griffin, we only have to wait until April. I could look at this next one for hours and still see something new the next time I came to it. From a distance, it’s a girl standign in a garden, backed by a stark winter scene. But the DETAILS! Holy crapoley, the details. Just listing them off doesn’t do them justice, but hints to the story are woven all through the painting like a seek and find. There’s a blank eyed woman hidden in the girl’s hair, a red mist or vapir rising from a bottle in her hand. There a person with a knife just below her, and below that a skeletal figure holding what could be a spear, an arrow, maybe even a boat hook. There are talismans and books, fireflies that dance around a figure with eyes closed as in despair- or benediction. A halo of light surrounds a woman with closed eyes in the upper left corner, a small child nearly identical to her posed agaisnt her heart. The garden around the girl is rich and vibrant, full of flowers and colors (and a snake twining around her around) but as it moves away from her, it grows more brittle, thinner and with duller colors. And oh, how creepy that background! All greys and pale blues, colors of ice and the dead of winter, with a figure playing banjo in a graveyard alongside a creek and a dark church. A little farther back, there’s a doorway that could be to a tunnel, but given the shoring is more likely to a mine, and even further yet is a house nearly lost to the distance and the dead mist. This cover can tell the entire story on its own, and it’s a beautiful one full of hidden dangers, buried blessings, and a cold that kill even the richest garden. Best of all? This one’s already out. 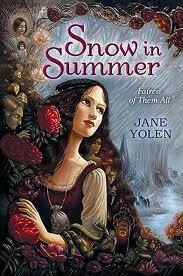 Snow in Summer by Jane Yolen is a Middle Grade sitting on the shelves right now. For the last title this month, we’re playing with another graveyard, but how freakin’ gorgeous is this? 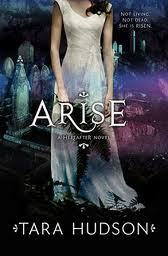 Arise is the sequel to last June’s Hereafter. Against the deep pine at the base of the cover, the rest of the background is almost like the Southern Lights, soft blues and pink-purples, which makes the detail of the above-ground graves pop. It’s not that they’re out of place- they aren’t- but rather that they give the impression that death isn’t stark, it isn’t terrible. The graveyard is old and, as can be seen from the growth of the grass, a little neglected, but not actually in disrepair. In the center we have a girl who’s clearly a ghost. The whole seeing through her thing gives that away. BUT, as you go up from the feet towards the (missing) head, she becomes more tangible, more solid. So not completely a ghost- but not completely alive. She’s something in between, and I’d be willing to bet that a large portion of the story is dedicated to that in between state. This one will be out next June. Any covers you’ve fallen in love with over the past month? Share below!